Six years later, when Slideshare was acquired by Linkedin, it hosted nine million presentations, and had 29 million people perusing those decks. People do like that. Peoples like slidedecks. While I’m happy for Rashmi, I worry about us. As well as Slideshare’s meteoric rise, the most popular books on presenting now, Slide:ology and Presentation Zen are distinctly slide-centric. How is it we’ve become so obsessed with slides? Slides are not a presentation. If slides are done well, they are a visual accompaniment to the verbal presentation. Each slide should reinforce the talk’s ideas in a way that makes those concepts memorable and accessible. Why do we have slides? They are NOT supposed to be notes for the speaker. Those you make on index cards. Slides should complement the spoken word. I’m not against slides; roughly 2/3rds of our brain is involved in visual processing of one sort or another. It seems wasteful to not take advantage of that. But slides are not the heart of the talk nor are they the only way to bring a talk to life. If you have to give a speech and your first act is to open PowerPoint, you’re doing it wrong. If Not Slides, Then What? If we put on a play, we help our audience visualize with costume, sets and props. Why not more often in presentations? The big names do it. Nancy Duarte discusses the importance of having a S.T.A.R. moment: Something They’ll Always Remember. Her clients often accomplish this with props. For example, Michael Pollen wanted to tell people how much oil they were consuming when they consume fast food. 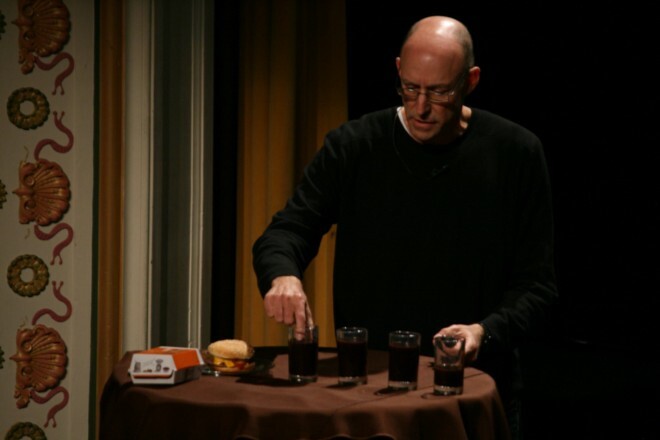 He could have done this with a chart, or even a clever turn of phrase, like “every Big Mac requires a quart of oil to make.” But instead, he takes his time and slowly pours actual oil into glass after glass as he described each step of burger processing. Pouring disgusting black goo in drinking glasses is visceral — more powerful than a pie chart and more memorable than a metaphor. Other effective S.T.A.R. moments include Bill Gates releasing a jar of mosquitoes into the TED auditorium, Jill Bolte Taylor picking up a real brain in gloved hands, and Steve Jobs pulling an iPod Nano from his jean’s watch pocket. Using props and dramatic gestures may sound uncomfortable at first, but it’s critical to get past that. Once you agree to step on stage, you are a performer. A presentation is not about you. It’s about your audience’s journey. And your job is to do what it takes to make that person’s journey arrive at the destination you’ve chosen, be it to awareness, knowledge or a shift in opinion. “The organizers like to provide slides for people who can’t make every session,” The volunteer’s phrasing suggested a memorized script. There are a growing number of us live-drawing our talks. With the rise of sketchnoting and visual thinking, more speakers than ever have enough visual literacy to represent their ideas on paper… or flipcharts, or a projected ipad. In Draw Your Future, Patti Dobrowolski uses a massive paper canvas to illustrate her talk. She draws out each key idea as she explains it. Sketchnoters have been live sketching talks other people give for some time, but Patti drew her own, and it’s incredibly effective. Audiences LOVE to watch people draw. Bob Ross taught us that. I have no idea why drawing is so mesmerizing, but I know from my travels that if I stop and sketch, someone will come and rubberneck. It doesn’t matter if it’s a good drawing or a bad one, if you are drawing, people will watch you like a mongoose eying a cobra. You can see the entire talk. With slides, you can only see one slide at a time, and you have to reply on the audience’s memory to make connections. Patti’s giant canvas approach (pioneered by Dave Sibbert)gives the audience the ability to see all the points at once and how they are related. I teach an entrepreneurship class at California College of the Arts, and my students have to present every single week. One group bravely tried a different style every week. My favorite week was the one where they drew the entire presentation out on a long whiteboard in our classroom. Jenny, Sergio and Essie rock the whiteboard as they give their “Lessons Learned” presentation. Predraw parts of your canvas. Having a layout guides your talk and provides a blueprint. Pre-drawing acts both to remind you what’s next and to tease the audience with a glimpse of what’s to come. Keep it simple. Don’t draw everything, draw the key points. Use recognizable icons. Practice every drawing. Never expect you’ll suddenly figure out how to draw an envelope or a shopping cart when you are on stage. Plan what you will draw and how you’ll render it. Practice until it’s effortless. Use a very limited set of colors. Switching colors takes time, can look awkward, and results in a messy canvas anyhow. Restraint is your friend. He only draws circles. They aren’t even good circles. They are more of ovals. And his handwriting and spelling is atrocious. IT DOESN’T MATTER. His message is clear and memorable. His drawing bangs home his points. He does a lot with very little. You can too. You can Live-draw your talks two different ways: on the wall or projected on-screen. First, make sure you have a wall. This may sound funny, but most stages don’t have a wall to hang a large sheet of paper on. You can use a flipchart easel, but it shakes. Graham Shaw hugs his flipchart. You can see him doing it in his TEDx talk, Why people believe they can’t draw — and how to prove they can. This presses the easel down, giving it stability. It also keeps him from turning his back on the audience. There are times when the walls are not an option. At Stanford, I teach in a room in Lathrop Library that is full of pillars blocking the sightlines. Luckily, it also has monitors on every wall. If I draw on the whiteboard, my students crane their necks and struggle to keep up. If I project, everyone can see. You may also get a room with no viable walls, or a hotel that will not let you hang anything on the walls (I have had this happen.) You may have to project your drawings. If you want to project your drawing on-screen, you can either use a document camera or a touch-screen device. Drawing on a touch screen is harder and less precise. A document camera is a way to turn any piece of paper into an overhead projector (remember those!) You can watch Dave Gray use it in this video. Dave swears by his Elmo. I love my Ziggi. I have also used the ultra-compact Hovercam as well, and it’s only slightly more awkward but much smaller and lighter. It’s great to have a document camera in your pocket for explaining things remotely as well as on-screen. Dave and I both use big index cards and Sharpies to sketch. The thick pen makes the drawings easier to read, and keep you from getting fussy. Veronica Erb pre-draws some of her Index cards, using some as you might use slides and creating the others on the spot. You can also use your tablet or other touch device. Cameron Moll wrote up his experience presenting with 53’s Paper app. When I gave my Story workshop, I gave it twice. The first day everything went as planned, and I used a document camera to project my drawing as I sat at a table at the top of the room. The second day my computer decided it didn’t want to talk to the projector. Or the projector didn’t want to talk to my computer. But since I had flipcharts for the exercises, I got up and drew on the walls instead. Thus by accident I discovered the many advantages of paper on walls. You can see the entire talk at once, as I mentioned earlier. I’d draw on one flip chart, then put it up next to the previous one, creating a trail through my ideas. When it came time to do exercises, the attendees could easily refer back to previous examples. You are up and interacting with the audience, rather heads down at the table. When at the whiteboard, your body language is open, rather than closed, and that invites the audience to interact with you. 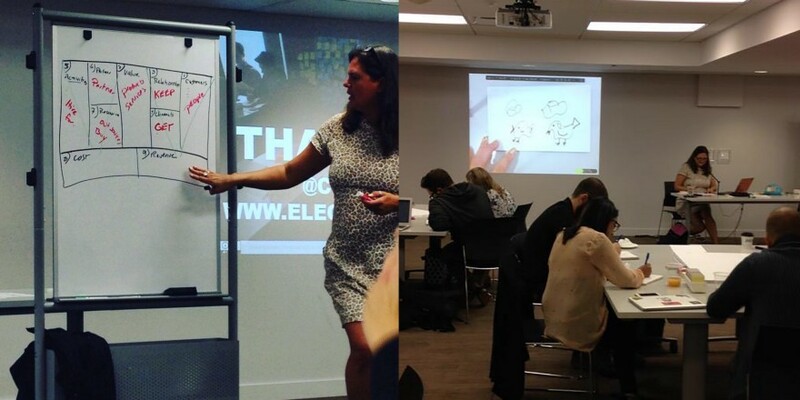 Look at these two photos taken at one of my Design Thinking Workshops. In it, I use everything: slides, whiteboards and the document camera. Look how much more inviting the presentation is when i’m up at the whiteboard. When I teach the fundamentals of drawing, the document camera is perfect, because it reduces people’s anxiety. I’m not “watching” them. A flipchart or whiteboard is much better for encouraging questions and discussion. Live drawing is engaging, entertaining and interactive. I think it’s got slide beat hands down. Can’t We Please Use Slides? Sure! I still use slides, especially when I have to give a talk on short notice. Slides are still the easiest way to illustrate your ideas. And there are a ton of books on how to make them good slides, from Slide:ology to Presentation Zen. But consider this: How many slides? Lots of folks give their talks with no slides. They just talk. Like folks like Abraham Lincoln and Martin Luther King did. Just talking is a viable strategy. At the last IA Summit, Cory Doctorow gave a talk with one slide. It was of a “Internet of Things” rectal thermometer. That thermometer helped make many of his points. Many speakers are no longer finding an image for every single point. Instead, they show a black slide, which makes the screen seem to go dark. You can use three, five or twenty slides, and “go dark” when you want the audience to focus on your words alone. Scott McCloud has over a hundred slides in his talks. He believes firmly that imagery reinforces message, and less is not more. His daughter Sky’s is even more vertigo-inducing. You cannot look away, every moment is full of vision and ideas. The right number of slides depends on you, your style and your story. A presentation is first and foremost a performance. It’s your job as a speaker to find a way to make your points as effectively as you can. If you start with your message, you’ll know what the right way to express it is. Next time you are asked to speak, don’t open PowerPoint. Instead grab a pencil and a stack of Post-its and get your ideas organized. Then, when you know what you want to say, decide how to say it. Maybe it’ll be drawing. Maybe it’ll be juggling! Or maybe you’ll make a deck. And it will be a good deck, with just the right number of words and pictures. Separator image Posted in Business, Presentation Tips.